Kansas City, Mo. — Missouri Southern sophomore Cam Martin has earned his second All-Region honor as Martin was tabbed as a first-team selection by the National Association of Basketball Coaches (NABC) Monday. Martin is a first-team All-District selection and joins Joey Witthus and Trevor Hudgins from Northwest Missouri to be named to the first team as members of the MIAA. Washburn’s Javion Blake was a second-team selection. The All-American team will be announced tomorrow. 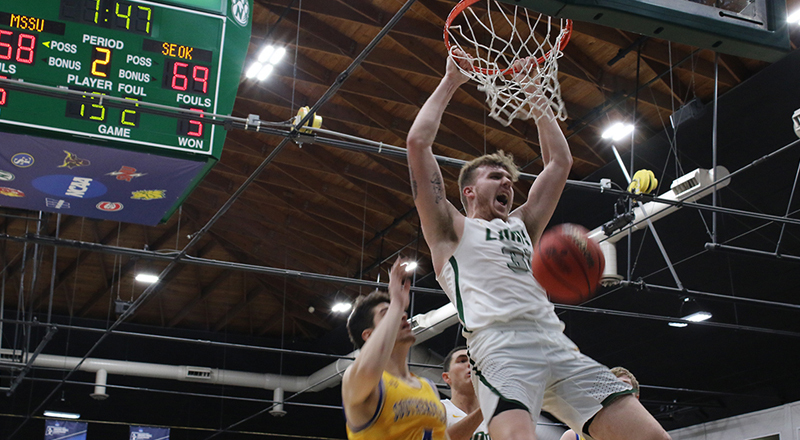 Martin was a first-team All-MIAA and first-team All-Region (SID’s) pick already this year and finished the season as a member of the NCAA Division II Central Region All-Tournament Team as he helped the Lions advance to the tournament finale, before bowing out to No. 1 Northwest Missouri. Martin averaged 33.7 points and 12.5 rebounds in the tournament as he tied the Missouri Southern single-game three-point record with nine made against Washburn in the opening round. He scored 46 points in that game and that stands as the 10th-most in a single game in Division II (tournament) history. He helped the Lions set the team record for single-game three’s in that game as well as Southern made 22 which was one off the single-game tournament record. This year, Martin became only the second Lion ever to score 700 plus points in a single-season joining Taevaunn Prince. He finished the year averaging 22.5 points and 9.7 rebounds, while shooting 61 percent from the field, 35 percent from the three-point line and 82 percent from the free throw line. He led the MIAA in scoring, defensive rebounds, double-double’s, free throw percentage, free throw’s made and attempted, total field goals made and total rebounds, while ranking second in rebounds per game. Martin ranked third nationally in free throws made and double-double’s, while ranking fourth in free throw attempts, 10th in field goal percentage and total points, 12th in total rebounds, 15th in scoring and 22nd in rebounds per game. The complete All-District team is listed below.